Nokia has had a hard time of it over the last few years. Once, they ruled the waves. But a lack of innovation coupled with out dated software and the rise of the smart phone in Apple and Android devices had left the company all at sea. So Nokia teamed up with the emerging Windows Phone OS platform last year. After releasing a smattering of phones they released their new flagship phone the Lumia 900 in May. So can Nokia replicate its earlier success? Is Windows Phone a viable alternative to IOS and Android? Read on and see. I’ve made no secret in the past that I believe the Lumia range to be some of the best looking and best designed phones on the market right now. The 900 does not disappoint. Nokia have tried to do something different and it works. I would actually go as far as to say that the Lumia 900 is not just one of the best looking phones I’ve seen, but one of the best looking portable devices, be it phones, gaming, or media wise. The one sticking point with the design however is the weight. I was not expecting the 900 to weigh as much as it does. It weighs in at 160g, which in comparison to the Galaxy S3 at 133g is noticeable in the pocket. The power/sleep button is mounted on the side, which is a great idea and allows the 900 to be woken from sleep whilst holding the device in just one hand. The 900 also features a physical camera button and it’s a welcome addition, the camera can be directly accessed by holding it down without the need for touching the screen and starting up a camera application. The Lumia 900 features a Qualcomm APQ8055 Snapdragon CPU. Whilst this is a decent CPU in it’s own right it means the Lumia 900 lacks the speed of the latest quad core CPU smart phones from Samsung and HTC. 512mb of ram also means that opening of applications is noticeably slower than on the One X and the S3 but this is to be expected. The Lumia 900’s display has both blessings and curses. The display has some of the deepest blacks I’ve seen on a phone. This is due to the Nokia ClearBlack technology within the screen and it’s certainly a technology that works. But the 4.3-inch display with a resolution of 800 x 480 doesn’t really cut it. Especially given the competitors for this phone are the One X, S3 and 4S all of which have stunning screen quality. 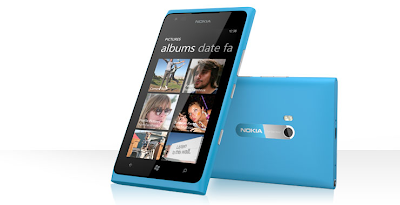 The Lumia 900 features an 8MP camera with Carl Zeiss optics. The camera is not spectacular, but at the same time is not awful. It’s just so-so, it’s a perfectly fine phone camera but just don’t expect amazing quality. One thing I have noticed is that when shooting pictures of bright objects such as my white MacBook I get a strange pinkness toward the centre of the display. It’s not replicated in the final picture but it is a little annoying at times. An area in which the Lumia 900 shines is battery life. I actually feel almost spoilt by the length the battery lasts. I’m just not used to this kind of charge length anymore given the battery life of smart phones like the One X, 4S and S3. 16GB of internal storage is enough to meet my own means but I would expect it to disappoint some, especially given the fact that there is no option for an external storage source like in the S3. The Lumia 900 runs Windows Phone 7.5 (Mango). I actually really like the design of Windows Phone. As an OS it feels clean and is easy to use and I love the way the metro style live tabs update. Also of note is the design of some of the first party Apps, I actually found Zune to be a delight to use and the same can be said for the pictures app. But that’s where the compliments end. As an OS it feels like it’s still very much in it’s infancy and yet this is a platform that’s almost 2 years old. The lack of apps developed for it is glaring and the lack of customization available gives a feeling of being behind bars at times, it feels more locked down as a platform than IOS. 3rd party apps sometimes don’t feel like they’ve been optimized correctly for the platform with some pretty frustrating scrolling issues being my main annoyance. Overall Windows Phone just doesn’t cut the mustard against IOS and Android anymore. The Nokia Lumia 900 is an amazingly well designed phone for those with an eye for aesthetics. The Hardware design is unrivalled and Windows Phone OS is beautiful from an aesthetic viewpoint. But when these are factored out the Lumia 900 starts to become pretty ordinary and at times frustrating. Can I recommend it? Yes, for those with a keen eye for design and for the simplicity that Windows Phone affords. For those who enjoy the freedom of android or the stability of IOS then it’s a case of “Move along, nothing to see here”. For me, the beautiful aesthetics of the Nokia Lumia 900 are overshadowed by the disappointments in hardware and software; it’s something I personally could not work through. Sometimes…it’s not just about looks.